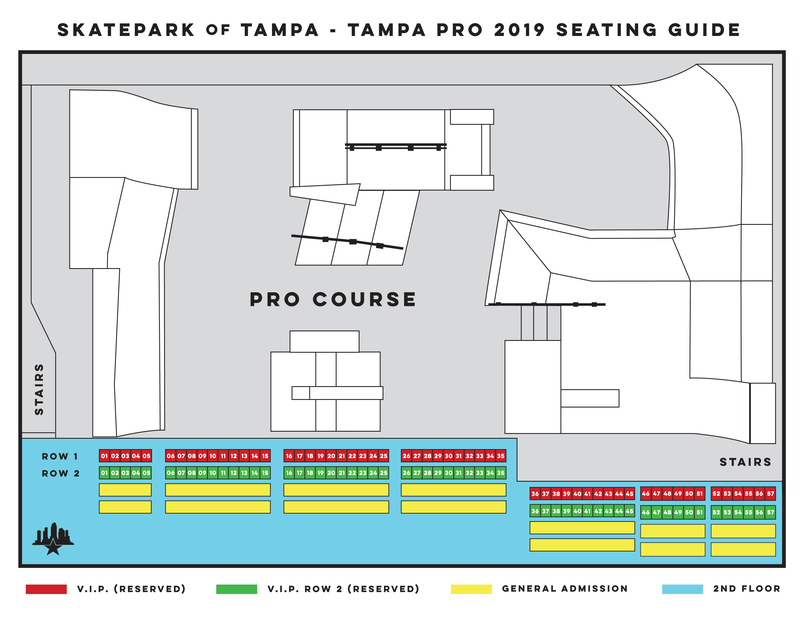 The purpose of this is to answer any questions you have about seating and ticket prices at Tampa Pro. If you still need something cleared up, check out the official event page here or email us at info@skateparkoftampa.com and we'll be happy to help. That's an easy one - go to the Will Call ticket page here to buy them. If for some insane reason you don't own a computer or device that has internet, you can get some in the SPoT Shop here in Tampa. Just ask a staff member for help. We're also offering Weekend Passes ($30), which get you in each day, plus all the night parties AND you save $$$$. Oh and did we mention there are V.I.P. tickets? What are the V.I.P. Tickets? If you bought them online - First and last name of the person who ordered the tickets. This is on a case by case basis, but the general rule is all ticket sales are final. If you can't make it and want to give your homie the tickets, just make sure they claim them under your name. Any other ticket issues, please email info@skateparkoftampa.com.